Same Day Denture Repair Service - Trusted Since 1998. Thousands trust Denture Repair Lab for quality,care and convenience. Same day denture repair by experienced dental repair technicians. All types of broken denture plates repaired. Denture Repair Lab provides dental partial repair services for all types of broken partial dentures and dental flipper repair. Broken denture tooth repair process is fast and easy. Lost denture teeth replaced on most dentures and dental partials. Duplicate denture is backup denture or denture clone made from impression of your denture. Spare dentures used as emergency denture. We specialize in the same day denture repair of all dental appliances, no matter on how they are broken – we can assure you that we have seen it all! From dentures that have been run over by a car, to dental partials that have been chewed by a dog, we are prepared to face anything that comes our way. Every dental technician at Denture Repair Lab possesses very extensive broken denture repair experience, so nothing is impossible for us. We offer a completely transparent denture teeth repair process from beginning to end. From accurate and upfront denture repair pricing, to the ability to check on the status of your denture teeth repair order; we understand you want to know where your dental appliance is in the repair process and promise to keep you informed every step of the way. Not sure what dental repair service to choose? No problem! Call our Support Team for a denture repair estimate or send the dental appliance in for a complimentary inspection. With no obligation, we will tell you exactly what it will take to repair your broken denture. We understand you live a busy life, with that in mind we have streamlined the denture teeth repair process to insure you experience the fastest turnaround time in industry. 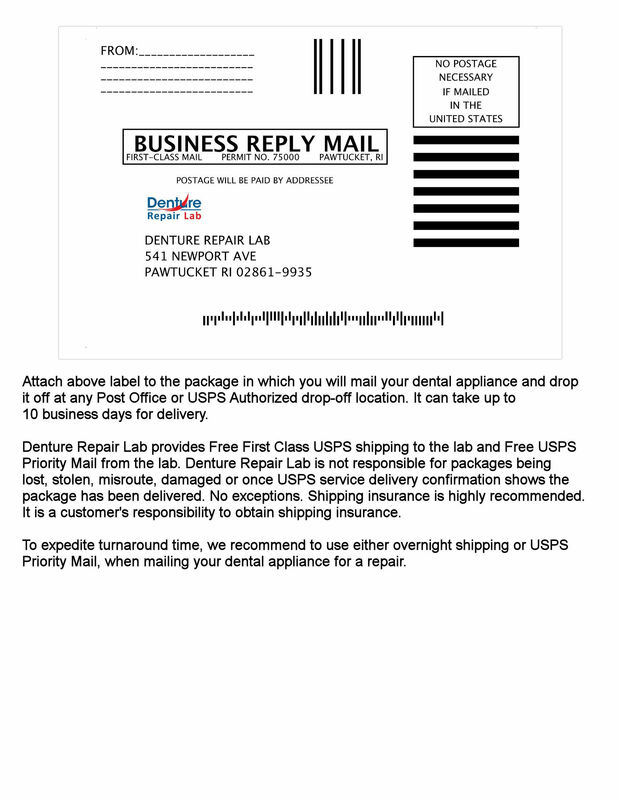 Once dental partial appliance is received it is repaired and mailed back same day with complimentary Priority Mail. Most in-lab denture repairs are completed within couple of hours and you never need an appointment. You, the Customer, are the most important aspect of our business at Denture Repair Lab. With our friendly, dedicated support team, rest assured your satisfaction our number one priority. Dental repair services by Denture Repair Lab warranted being free from defects in materials and craftsmanship. All removable dental prostheses will be repaired using the best materials and technicians expertise and will conform to the written specifications provided with each work order. Any removable prosthesis that meets the qualifications for remake and experiences a defect in materials or workmanship within a period of 30 or 90 days depending on the warranty will be repaired at no charge.